Since the dawn of human fall, those who remained FAITHFUL knew that there would never again be PEACE on EARTH, never again be TRUE PEACE on earth till EVERY LIE, EVERY FALSE form of GOVERNMENT and TREACHEROUSLY PARTIAL and thus POLLUTED form of RELIGION is proven FOOLISH to be SILENCED across ALL the NATION and henceforth heard NO MORE among the nations FOREVERMORE! (Isaiah 48:1-<14-49:6>-51:8) In that YAH has promised an AWAITED ONE unto whose CONSUMMATE WORD .. ALL the NATIONS beyond EVERY CONFUSER must CONVERT unto the RESTORATION of THE COVENANT, how is it that men have believed TODAY’S DIVERSE DOCTRINES to be before YAH, a COVENANT at all? (Jeremiah 30:1-31:31-36) WHY is it that YOUR RULERS did not admonish you concerning Him who comes to REPROVE THEM ALL? Gen 49:1 And Jacob called unto his sons, and said, Gather yourselves together, that I may tell you what shall befall you in the last days 49:2 Gather yourselves together, and hear, ye sons of Jacob; and hearken unto Israel your father. Messiah in all actuality, said these words. WHY have YOUR PASTORS .. NOT TOLD YOU the FULL IMPLICATION of this GREAT ADMONITION? To the EARLY CHURCH it was counted VERIFICATION of a GREAT EXPECTATION to ALL whoELIEVED the ANCIENT WORDS of the MOST HIGH true to ALL ROPHETS! POWERFUL STUFF HERE! SO POWERFUL IN FACT I DECIDED TO POST MY NOTES FOR THE CURIOUS SOULS WHO JUST CAN’T WAIT! THE HOPE OF SHILOH REVEALED! .. AND WHY the NATIONS ALL HAVE DESPISED TO SCHEME AGAINST THE PEACE! HAVE YOU NOT YET HEARD THE TRUTH? HEAR WHAT THE MOST HIGH HAS COMMANDED UNTO ALL THE FAITHFUL WHO WOULD BELIEVE TO SERVE HIM! ISAIAH 41:21-42:4 makes it PLAIN that the RULERS would SCHEME AGAINST MONOTHEIST FAITH, even against the HOPE of a SAVIOR-SHAHSHANSHAHE-SHILOH-KURDI till being UTTERLY DOUBLE-MINDEDLY TAINTED after WORLDLINESS, NONE has DISCERNED FULLY indeed what is RIGHTEOUSNESS, even the HOPE of a RIGHTEOUS ONE to RESTORE the TRUTH of THE GOSPEL of HOLY KINGDOM YAH! They believe that the GOSPEL IS LICENTIOUSNESS for ALL the MULTITUDES of PRESUMPTUOUS IMAGININGS resultant of the CARNALITY! They have ENTIRELY PERVERTED to CORRUPT the HOLY GRACE and KNOWLEDGE of YAH and will NOW have to be CONVINCED regarding the UNGODLINESS of the DOCTRINES they TRUSTED; to discern that their DOCTRINES and they who TAUGHT THEM were ALL LIES and LIARS! They will have to DISCERN that EVERY DOCTRINE that has NOT UPHELD the HOPE of SHILOH were ALL conceived VOID of HEARING the SPIRIT of YAH and we NEVER the WORDS of FAITH! Indeed! The RULERS have NOT taught the DOCTRINE of SHILOH so as to DESTROY the FAITH in YAH so to TAKE CONTROL of the PEOPLES after the HYPOCRISIES of their FALLEN RULERS! Gen 49:9 JUDAH is a LION’S whelp: you return from the prey, my Son, you are like a LION who couches to lay down; as an GREAT LION; who shall ROUSE HIM UP? 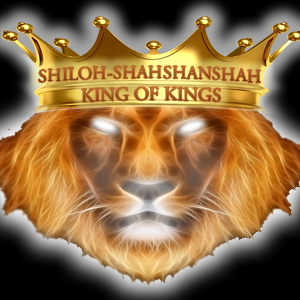 Gen 49:10 The EXPECTATION of a SCEPTER shall not depart from JUDAH, nor the AWAITING of a LAWGIVER to come from between his feet, until SHILOH come; and unto Him shall the GATHERING OF THE PEOPLE BE! CONSIDER CLOSELY THE IMPLICATIONS HERE! From the time that YACOB passed on the BLESSED PROMISE to his son, YEHUDAH, it was ultimately a PROMISE that the BLESSED ONE, even the SHILOH-KURDI would come out of the seed of ZION, even more specifically out of the TRIBE of YEHUDAH from whence later came the beloved king, DAVID!! Even more implicit in these passages is the forethought that the hope of SHILOH for GLOBAL PEACE was already for them who trusted in YAH for ultimate REDEMPTION in this world, an an AWAITED EXPECTATION beyond all varied MISOPINIONS of the NATIONS! This world has had NO PEACE since the DAWN of HUMAN FALL! How is it this DIVINE PLAN whereby PEACE must come, been so little understood among the NATIONS? To THIS DAY, the NATIONS and DENOMINATIONS do NOT KNOW and they RESIST KNOWING their NEED for SHILOH. They prefer to believe they have NOT been VICTIMS as a REASON for their LACK the KNOWLEDGE of THIS GREAT EXPECTATION! They prefer to believe even in them who have PERSECUTED THEM unto this UNBELIEF! They believe that they who SLAUGHTERED the SAINTS that this MONOTHEIST HOPE be SILENCED from the DOCTRINES of CONVERSION have become the FAVORED of YAH, even their PRESENT SAVIORS! They PREFER to BELIEVE that though their is NO AGREEMENT among MEN TRUE to ALL that YAH has SPOKEN to PRESUME and HOPE that ALL ALSO PRESUME there is NOTHING DIVINELY WORTHWHILE that PRESENT SOCIAL MISORDER has FORGOTTEN! They BELIEVE that because it has been SO LONG that this issue of SHILOH has been WHOLE-heartedly addressed among the DERELICT-in-DUTY “CHURCHES” attend, that TODAY this CONSTANT EXPECTATION unto the PRESERVATION of FAITH in ONE, is of LITTLE CONSEQUENCE! They say “CHRIST” gave HIS LIFE for their SINS never realizing that IF they were CONVERTED, they would KNOW to SEEK NO OTHER CONSCIENCE but of YAH! The GENTILES, even ALL NATIONS would KNOW therefore that their ALLEGIANCES to the VAST MULTITUDE of their RULERS is DOUBLE-MINDED INFIRMITY, IDOLATRY, VANITY, .. SIN! They would KNOW their RULERS are SIN who HIDE or DISSUADE the PEOPLE against DISCERNING that the DIVISIONS they uphold are TREACHEROUS PARTIALITIES and POLLUTIONS; and that the TREACHEROUS PARTIALITIES and POLLUTIONS are THE REASON wrought in DISSIMULATE HYPOCRISIES unto their HOSTILE DIVISIONS! They would KNOW that the ENTIRE CONSTRUCT they TRUST is AGAINST HOPE of a SAVIOR, AGAINST HOPE for a SHILOH-SHAHSHANSHAHE, AGAINST the HOPE for an END to WORLDLY CONFUSION and WARFARE, AGAINST the HOPE for EVERLASTING PEACE on EARTH! For ALL the RULERS over the HEATHEN have desired and SCHEMED to to be fashion ie. show THEMSELVES ALL to be counted as SAVIORS! They fashioned each one of them that they are SAVIORS each one unto the ALTERNATE REALITY they CREATE in the LANDS over which they claim to have SOVEREIGNTY! The PEOPLE NOT KNOWING they are DAMNED under DEVIATE ALTERNATE RULE are taught ALLEGIANCE that they must FIGHT for the SOVEREIGNTY of “THEIR COUNTRY”. They do not realize they have been BEWITCHED to EXALT them whose SCHEMES are but VANITY, even ANIMOSITY against the SALVATION of their VERY SOULS! Therefore when the ANOINTED ONE APPEARS who will EXPOSE even will DESTROY the WILES of THESE WICKEDS/ WICKEDLY LAWLESS MEN .. unto HIM shall the NATIONS SEEK that HIS PEACE shall be GLORIOUS, even it shall be counted GLORIOUS when a world is AT PEACE! For the MISCREANT RULERS of the EARTH have called it GLORIOUS that each soul should count THEM to be SAVIORS unto “ETERNAL VALHALLA WARFARE”! They who gave their LIVES in DEFENSE of their “COUNTRY” they believed were given an HONORABLE PLACE in the WARFARE that was to come in the “GLORIOUS AFTER-LIFE of CONTINUAL WAR” that they FIGHT FOREVER at the side of their WARRIOR ANCESTORS! The IRRELIGIOUS IMAGININGS of WESTERN POLYTHEIST GENTILES had NO PLACE for a SHAHSHANSHAHE-SHILOH in that the idea of ONE unto whom EVERY KNEE SHALL BOW and EVERY TONGUE CONFESS that as the YAH’S ONLY BEGOTTEN SON-KING HE is THE AWAITED LORD CHOSEN to REVEAL the TRUE and EVERLASTING GLORY of THE ONE YAH-ELOHIM as HIS FATHER that even unto HIM shall MIGHTY KINGS COME .. and shall SWEAR ALLEGIANCE .. was unto the DIRECT SHAME and ANNIHILATION of ALL that had been the FORMER PRIDE of the RULERS and the NATIONS over which they CLAIMED to have DIVINE RIGHT unto AUTONOMY! (Isaiah 45, Isaiah 49, Isaiah 41-43) The idea of the EXPECTATION of a SAVIOR-SHAHSHANSHAH-SHILOH unto ONE PEACE on EARTH; especially the idea that that PEACE would come of a SON of a NATION TZIYON whose TRADITIONS whose ORIENTATION the GENTILES both LACKED; was ABHORRENT to the NATIONS! 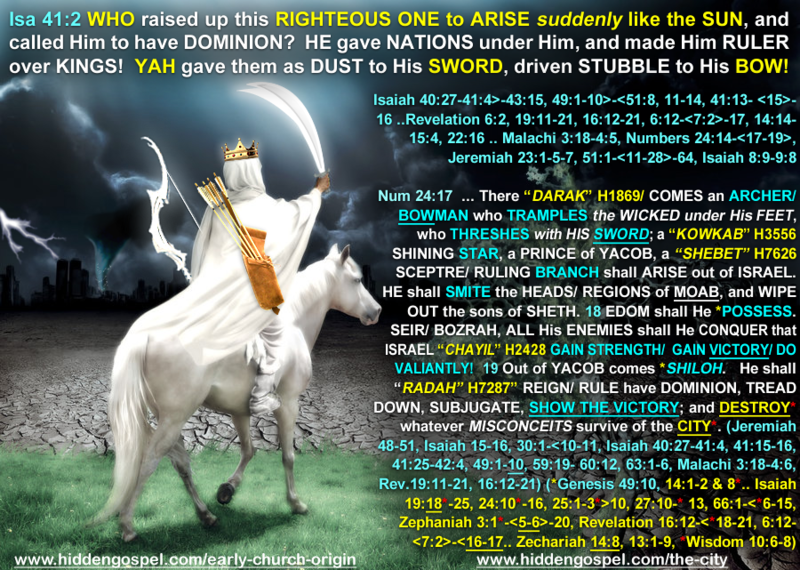 For ALL the RULERS of the GENTILES desired that THEY ALL be counted SONS OF A GOD! They each desired that THEY ALL be counted “SAVIORS”! They either DESIRED that ALL be counted SAVIORS, or that they ALL were FAVORED SONS who had VARIED DEGREES of FAVOR from their VARIANT “gods”. In these latter times as in the days of WESTERN NIMRODIAN ROMAN MOABABYLON of old, the RULERS among the GENTILES have said that they ALL had DIVINE POWER to DECLARE what is SOVEREIGN RIGHTEOUSNESS and even to PARDON MEN from even being counted TRANSGRESSORS according to THEIR WILL upon the LANDS which they SUBJUGATED! They believed themselves to have POWER to declare what IS or IS NOT “ACCEPTED REALITY” to the PEOPLE over which they RULED! Their RULERSHIP was dependent upon the PEOPLE being kept in DARKNESS, UNAWARE of RIGHTEOUSNESS GREATER than their RULERS! Therefore the DISPENSATION of the GOSPEL from ON HIGH, the WORD of ONE CREATOR YAH was seen by THEM to be an IMMEDIATE THREAT to THEIR LARCENOUS SOVEREIGNTY! Indeed, in that they HATED the LIGHT of the GOSPEL, they were and ARE till this DAY, ALL of them who would UNJUSTLY SUPPRESS the KNOWLEDGE of the TRUTH to be counted PRINCES of the PRINCE of DARKNESS, even ALL of them the CHILDREN of WRATH! For they SUBJUGATE the MINDS of the PEOPLE even from the DAWN OF HUMAN FALL against REMEMBRANCE of what was declared from the times of the GARDEN, was the ANCIENT HOPE of the one the ANCIENT ONES EXPECTED, the AWAITED RIGHTEOUS ONE called “OPHIUCUS-SAYOSHIANT”, MAHDI the KURDI-MESSIAH-SAVIOR! MEMORIES of EDEN, the NOAHIC FLOOD, FALL of BABYLON’S TOWER and even the REMINDERS of CONSTANT WARFARE kept preserved in the EAST this HOPEFUL EXPECTATION of ONE by whom PEACE would come! Yet RUTHLESS ONES across the SEAS who had lived RUTHLESSLY WITHOUT the DISCIPLINE of this ANCIENT EXPECTATION upon WESTERN FOREIGN SHORES had NOTHING to keep in their CONSCIENCE a REVERENCE for this GALVANIZING HOPE! Therefore the AMBITIOUS IMPERIALISTS of the WEST did UTTERLY DESPISE the TRUE DISPENSATION of the GOSPEL. They even HATED the HOPE of ONE SON OF THE ONE SUPREME LIVING YAH ELOHYIM who in the EAST NOW HAD TWICE COME and REMAINED thus remained EXPECTATION for HIS THIRD APPEARING for SOVEREIGN PEACE after the INVARIANT GLORY of YAH HIS FATHER! It was COMMANDED of OLD that this EXPECTATION should remain as the CORNERSTONE of the FAITH! Yet WESTERN IMPERIALISTS knew that to SILENCE this “WATCHFUL AWAITING” would be to ENSLAVE a WORLD ENTIRE after a ALL its PRETENSES! WOE upon the “CHURCH” called “MOTHER” AND ALL her CHILDREN! The CHURCH of ROME that FIRST devised schemes against the MOST HIGH and against the true knowledge as to WHO IS and HOW shall be revealed HIS ANOINTED! Yet it is evident WHO are the CHILDREN of this MOTHER WHORE! For were today’s churches FOUNDED upon a CALL from the MOST HIGH, they would have discerned and TESTIFIED concerning the TRUE MESSAGE that the SAVIOR commanded MUST be TESTIFIED in ALL the CHURCHES! Rev 22:16 “I, YEOSHU, have sent My ANGEL, even MY MESSAGE that MUST be TESTIFIED unto YOU these things for the CHURCHES. …. And what is that TESTIMONY that CONFIRMS ALL that is these words of PROPHECY? Those who would understand all the allegory that is in the book of REVELATION must discern WHO MESSIAH said therefore that HE IS! HE said, …. It is because ROME set a SNARE for ALL the WORLD to FALL SHORT in by NOT understanding the true prophetic nature and promise of this TITLE, that a WHOLE WORLD has NOT understood WHAT is indeed the GREAT EXPECTATION of the FAITH! For NOT understanding the PROPHETIC POWER of THIS TITLE, men have FALLEN SHORT of the FAITH to trust in the DEBATIVE DOUBTFUL DIVERSITUDES of MEN not to discern the mass implications of the phrase, YAH is ONE! Just as the words of post-exilic prophet MALACHI sealed the FORMER TESTIMONY with testimony concerning EXPECTATION of the “ARISING SUN OF RIGHTEOUSNESS” who comes with HEALING upon His lips .. so the book of REVELATION comes with this SEAL! For the ancient EXPECTATION of SHILOH is the CONFIRMATION of FAITH! Indeed! GENESIS 49:10 should better have been interpreted, ..
“The EXPECTATION of a SCEPTRE shall not depart from JUDAH, nor the SEEK and WAIT of a LAWGIVER from between his FEET, until SHILOH COME; and unto Him shall the gathering of the people be. From of OLD, this EXPECTATION was to remain a FUNDAMENTAL COMMAND of FAITH that ALL should SEEK YAH that NONE FALL SHORT after the MANY forth-coming MISREPRESENTATIONS of MEN! A CONFIRMATION to ALL who BELIEVE! For the SAVIOR is the END of trust in the DIVERSE MISadministrations of MEN to ALL who BELIEVE in HIM! For NOT ALL have heard nor have all sufficiently UNDERSTOOD to PREACH the WORD of the GOSPEL! For when SHILOH COMES, ALL who BELIEVE should have KNOWN to PREPARE to EXCEED ALL WORLDLY AUTHORITY that they be WISE to be GATHERED unto Him! For it is NOT possible to silence every LIE, every short-coming and pollution after doctrines of many! Hallelu’YAH! Gen 49:10 The EXPECTATION of a SCEPTRE shall not depart from Judah, nor the SEEK and WAIT for a LAWGIVER from between his feet, until SHILOH come. Unto HIM shall the GATHERING of the people be. Gen 49:12 His eyes shall be RED with WINE, and his TEETH white like milk. The EXPECTATION, to SEEK even to WAIT for the coming of the chosen one called SHILOH was from Beginning a SAFEGUARD against men ever allowing ANYONE to pronounce a FALLING SHORT of the FULL REMEMBRANCE of the HOLY COVENANT! It is because MEN have NOT REMEMBERED this COMMAND, that all the present CONFUSIONS we see in this earth do presently remain! Mankind must know therefore that there is NO RESTORATION of MAN VOUCHSAFED STEADFAST unto the MOST HIGH but through the EXCEEDING EXPECTATION of SHILOH who will REPROVE ALL MEN that there be the REMEMBRANCE of RIGHTEOUSNESS as of OLD as in FORMER YEARS! That there be RESTORED in THIS GENERATION the RIGHTEOUS HEART of the FATHERS unto the CHILDREN! They who are wise and true to the Spirit will discern the TRUTH of the TESTIMONY herein above. They will know that I speak the TRUE WORD of SALVATION that is the GOSPEL EXPECTATION of ALL who through the ages have with the GUIDANCE of YAH, BELIEVED! THE MOST HIGH YAH IS ONE! THERE IS NO CONTENTIOUS CONTRADICTION, NO PARTIALITY IN HIM! HIS GOSPEL IS ONE JUSTICE for PEACE! YET NATIONS /CONGREGATIONS ARE DI-VIDED! 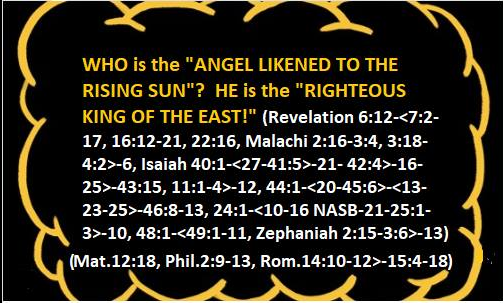 THE MOST HIGH HAS LOOKED! HE HAS SEE NO ONE PREACHING ALL THE PURE PERFECT GOSPEL OF CONFIRMATION UNTO HIS KINGDOM! SO THUS MUST THE SAVIOR COME TO ABSOLVE, SAVE, TO EXPOSE MANY RELIGIONS, CHURCHES, PASTORS, PRIESTS, ELDERS, RABBIS, RULERS, KINGS AS ALL PRETENTIOUS, EVEN DECEPTIVELY FOOLISH CHARLATANS AGAINST THE PEACE! WHO WILL NOW SEE SHOCKING TRUTH TO CEASE TRUSTING IN UNJUST COMPLICIT PRETENSE? PREPARE NOW FOR THE SON OF MAN WHO COMES TO EXPOSE ALL THE RULERS, KINGS AND PASTORS; AND ALL FALLEN FROM FAITH WHO FOLLOW SIN/ THEM! (Isa 41:21-43:15, 11:1-12, ch.24-27, 59:14-<16>-60:12) THE FAITH OF ABRAHAM’S TRUE SONS IS NOT OF MEN, BUT DIRECT PURE PERFECT WORD CONSTANT FROM ABOVE! (Rom 9-10 .. John 3:16) ALL ELSE IS SIN, MAN’S FALL FROM REFINING GRACE! YAH CAN SANCTION NO CONTRACT, NO COVENANT HE DID NOT WRITE! THERE IS BUT ONE WAY UNTO LIFE! WHAT THEN IS EVERY OTHER PATH? THE FAST APPROACHING “TIMES OF REFRESHIING” UNTO REMEMBRANCE OF ALL THINGS IS THE MOST PIVOTAL EVENT OF ALL SCRIPTURE SINCE WORLD BEGAN!! (Acts 3:18-23, Isaiah 28:1-<10-22>-<29:8-16>-<30:1-15>-32:8) PROPHECY SAYS YOUR RULERS WOULD NOT SPEAK OF IT LEST THE TREACHERY OF THEIR MANY MISADMINISTRATIONS BE EXPOSED AS MASS FORGETFULNESS! Unto HIS MIGHT, HIS HONOR and PRAISE ALWAYS! Hallelu’YAH!